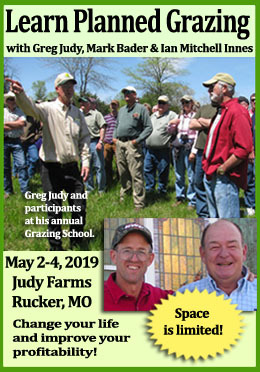 Greg Judy has great tips for getting through mud season so that your cattle are well-fed and your pastures are healthy and ready for the summer. This week marks the beginning of Spring. It’s the time when we start seeing a tinge of green grass poking its baby head up. Middle of March is also the normal time to have tons of mud to deal with. The frost is out of the ground, snow is mostly melted and the grass is barely growing. It’s this excess moisture that can turn your pastures into a mud lot if you are not careful with your livestock grazing management. You have several strategies at your disposal to keep from destroying your future spring pastures during this period. 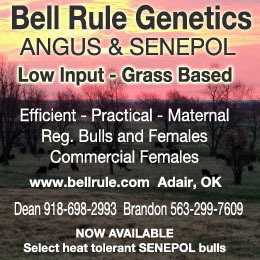 The most common method is to have a sacrifice lot to put your animals in while the ground is soft. You feed hay in this mud lot until it is safe to return your animals to the pasture. This method has both good and bad outcomes attached to it. The good is that your animals are not allowed onto your pastures which could leave pug marks and compactions issues. The bad points attached to leaving them in a mud lot sacrifice area are numerous. First and foremost you are now working for your cows, having to pack hay to them. Second, now instead of having all your nutrients of manure and urine deposited evenly across your pastures, it is all being deposited in a mud lot. What was an asset, now becomes a liability. When you drop that much manure, urine and hay in a mud lot, all you’re doing is growing a good crop of weeds the next growing season. Third, when you lock animals into a mud lot you are asking for a herd health wreck. Mud breeds disease, period. Once the cow hair coat gets covered with mud, it takes double the feed to keep them warm. Instead of a nice soft fluffy hair coat, it is matted in mud. I’ve known folks that calved in a sacrifice lot so that they could keep an eye on prospective new mothers. This is the best way I know of to get scours in new calves. Anytime you take animals out of their natural environment and coop them up where they are exposed to their manure, health issues will show up very shortly. So now that we have covered removing livestock from wet pastures and putting them in a sacrifice lot, what other options do we have? The other option that you have is leaving the animals out on the pasture using good grazing management to ensure that there is limited pugging. There are several management strategies that will help us through this time period when everything turns mushy. We use temporary poly-braid reels and build paddocks for each day or ½ day moves. I like the ½ day moves the best in the winter because it gives the animals the best daily performance. They are getting a fresh break of forage twice per day, they stay pig fat all winter. The ones that don’t stay fat, they just sorted themselves out of our herd. Remember the cow works for you, not the other way around. Our farm perimeters are fenced with five strands of hi-tensile hot wire. The interior of our farms are left fairly open, with limited permanent paddocks. Most of our paddocks will range from 10-60 acres in size. We used to have many permanent hi-tensile one wire paddocks across our farms. The advantage to having smaller permanent paddocks is that you don’t have to put up poly-braid to split down the paddocks into a more manageable size to graze. The disadvantage of having more permanent smaller paddocks is that it requires more water points which can be cost prohibitive. With more paddocks, you also have more permanent gates for mud pits to form and more dirt cattle trails. The small permanent paddocks also restrict your grazing movement speed when you need to open up the size of the paddock. When it starts raining in March or the snow melts with the frozen ground thawed, now you have to be on your toes. No vehicles except ATV’s are allowed onto our pastures at this time. You must have some winter stockpiled forage left for March-April time period. This is accomplished in the fall by calculating how many cow days of winter stockpile that you were able to grow. It does your pocketbook no good to enter winter overstocked. You will have to feed hay all winter because you ran out of fall stockpiled forage to graze simply because you have so many animals to take through the winter. We do have some purchased hay as insurance laid back at the top of hillsides from the previous fall. We may not need it, but if we get a late snow blizzard, its right there ready to unroll. Always hope for the best, but prepare for the worst! I don’t like the cost of insurance, but if my house burns down, it’s worth the price. With these larger permanent 1-wire paddock divisions it allows us so much more flexibility. If we get into wet pugging conditions, we can open up the size of our daily or ½ day paddocks to any size we like to spread out the animals. In very wet conditions, it is not the first step that the animal takes on soft ground that creates the problem. When the second step is taken close to the first step now you have a deep pug mark, compaction and possible weed growth area in the coming growing season. You do not want to make the animals clean up the stockpiled forage on these puggy pastures, move them. You are trying to stay ahead of the mud and may need to sacrifice some stockpile to do this. If you make them clean up all the stockpile before moving them in wet conditions, I promise you will have pugged the paddock. Speed of livestock mob is your friend, keep them moving until your pastures get solid. When monitoring the first grazed spring paddock, when we see leaves completely re-grown we stop our forward moving rotation of the mob through the farm. We make a cattle drive back to the first paddock and start over with our rotation on fresh grown leaves. We normally can graze about 70% of our total pastured acres on the first rotation and leave the other 30% of pasture un-grazed. By returning to the freshly recovered previously grazed paddock, the leaves are very palatable which gives us excellent animal performance. The 30% portion of our pasture that we do not graze in the spring is targeted for the middle of July grazing period. Absolutely do everything you can to resist mowing and baling this portion of your pasture. 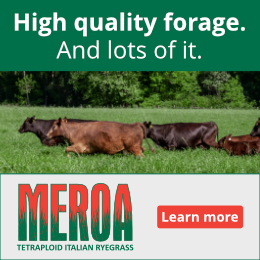 This is your prime opportunity to feed 1/3rd of your farm a heavy dose of fertility by trampling this mature forage on the ground. That finishes up mud season. We’ll talk about grazing through the summer in next week’s issue. Stay tuned!